WASHINGTON, DC, January 3, 2011 (ENS) – The Obama administration today eased requirements for oil companies whose deepwater drilling activities were suspended by last year’s moratorium imposed in response to the BP oil spill in the Gulf of Mexico. The Interior Department’s Bureau of Ocean Energy Management, Regulation and Enforcement, BOEMRE, notified 13 companies that they may be able to resume previously-approved activities without submitting revised exploration or development plans for supplemental National Environmental Policy Act reviews. But before drilling in deep water, the companies must comply with new policies and regulations established on December 13, 2010 by BOEMRE. The six month deepwater drilling moratorium was imposed on May 30, 2010 by U.S. Secretary of the Interior Ken Salazar, covering all locations on the Outer Continental Shelf. 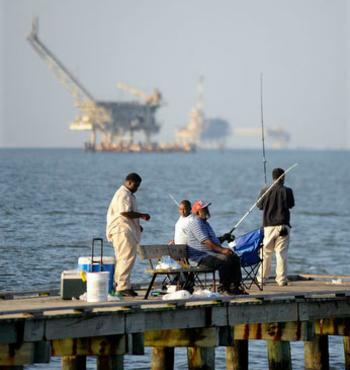 The moratorium was a response to the April 20 blowout aboard the Deepwater Horizon oil rig leased by BP that killed 11 crewmembers and injured 17 others. The resulting oil spill from BP’s Macondo seafloor well about 40 miles southeast of Mississippi Delta was the largest in U.S. history and the largest accidental marine oil spill in the history of the petroleum industry. It lasted three months and released 4.1 million barrels of oil into the Gulf of Mexico, fouling nearly 500 miles of shoreline from Florida to Louisiana and closing more than a third of the gulf to fishing. “For those companies that were in the midst of operations at the time of the deepwater suspensions, today’s notification is a significant step toward resuming their permitted activity,” said Bromwich. The 13 companies that received today’s notice are – ATP Oil & Gas Corp., BHP Billiton Petroleum (GOM) Inc., Chevron USA Inc., Cobalt International Energy, ENI U.S. Operating Company Inc., Hess Corp., Kerr-McGee Oil & Gas Corp., Marathon Oil Company, Murphy Exploration & Production Company – USA, Noble Energy Inc., Shell Offshore Inc., Statoil USA E & P Inc., and Walter Oil & Gas Corp. These operators will not be required to revise a previously submitted Exploration Plan or Development Operations Coordination Document if the worst-case discharge estimated for the project is less than the worst-case discharge estimate stated by the company in its Oil Spill Response Plan. But if the worst-case discharge exceeds the Oil Spill Response Plan, further reviews will be conducted, said Bromwich. Since October, when BOEMRE lifted its ban on drilling at depths greater than 500 feet, the agency has not approved any new deepwater drilling permits. For those who want to find information about the Deepwater Horizon oil spill, the National Oceanic and Atmospheric Administration today unveiled a web archive of the maps, wildlife reports, scientific reports and other previously released public information used by emergency responders, fishermen, mariners and local officials during spill. The NOAA Deepwater Horizon Library is online at: http://www.noaa.gov/deepwaterhorizon. “This website serves as a valuable learning tool and resource for scientists, students and historians of all backgrounds for many years to come,” said NOAA Administrator Jane Lubchenco. The archive also contains image and video galleries, fact sheets and publications, press releases and transcripts, educational resources, and mission logs by crew members on board several of the eight NOAA ships responding to the spill and the damage assessment. NOAA will continue to update the website with information products.